ROV Ventana connecting GSSM sensor package to MARS node. 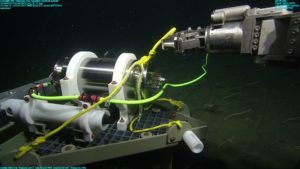 The University of Washington is testing a new instrument package named the Geodetic and Seismic Sensor Module (GSSM) that integrates the Paroscientific, Inc. Seismic Oceanic Sensors (SOS) module into a seafloor package that is attached to the MARS cabled observatory and controlled from shore. A three-component broadband accelerometer to measure the motion of the seafloor. Two Digiquartz ® pressure sensors designed to measure ocean pressures. A Digiquartz ® barometer to measure the pressure inside the instrument housing. A valve periodically switches the two pressure sensors from measuring the external pressure to measuring the internal pressure for five minutes. By comparing these internal measurements with the barometer, the long-term drift of the pressure sensors can be corrected. This calibration method is termed A-O-A and the GSSM deployment on MARS is the first non-proprietary test of this method in the ocean. The results to date are very encouraging and suggest that the A-O-A method will provide a new geodetic tool for measuring long-term vertical motions of the seafloor in tectonically active regions with an accuracy of a few millimeters. In regions where the seafloor is stable, the sensor may provide a means to measure long-term changes in sea-level. The research team from the University of Washington Applied Physics Laboratory includes: Dana Manalang, William Wilcox, Michael Harrington, Geoff Cram, James Tilley, Justin Brunett, and Derek Martin.